The devastation from the Fourmile Canyon Fire, years after in Sunshine Canyon west of Boulder, are still visible on Nov. 28, 2018 in Boulder. A recent climate change study shows that wildfires will be worse and more frequent because of climate change. Urban areas in Colorado continue to grow, and more of the population is moving into areas at high risk for wildfires. Fires burn more frequently and uncontrollably, ravaging the West’s pines, firs and spruces, destroying lives and buildings. Multiplying insects feast: Colorado’s forester last week said the state over two decades has lost a fifth of its forests to bugs, and a recent survey estimated one in 14 standing trees is dead. Shrinking Rocky Mountain snowpack is forcing farmers out of business, jeopardizing skiing, and compelling utilities to consider super-costly new sources of water, including recycled waste. And rising heat waves hurt people — especially children, the elderly, low-income outdoor workers and anybody who can’t afford air conditioning. These impacts of global warming, intensifying across Colorado and the West with costs in the billions, have happened precisely as scientists have been predicting. The latest National Climate Assessment — released by the Trump administration on the day after Thanksgiving — now drives home this scientific consensus that Colorado and its western neighbors will face worsening, potentially ruinous environmental upheaval as average temperatures that increased 2 degrees over the past 30 years keep rising. World leaders at a United Nations-backed forum in Poland this week will rally nations to try to minimize ecological harm after 2050, and while American scientists will be there, the U.S. government isn’t participating. Dead and burned trees still mar the land where the Cold Springs fire burned over 2 years ago on Nov. 28, 2018 in Nederland. Native Americans also predicted upheaval — including droughts, fires and floods. Ute Mountain Ute leaders watched as European settlers took Colorado mountain terrain and they prophesied that “the white man” would cause environmental calamity, tribal elder Terry Knight said last week from his home in the Four Corners region. “What you are putting in the air, what you are putting in the water, what you are putting in the ground — all this chemical contamination — it is causing an imbalance of nature, causing this drought and climate change,” Knight said. Heading into 2019, tribal leaders, like local governments around the West, are scrambling to deal with the worsening impacts. For Utes, the most painful has been losing mountain springs used for sacred ceremonies due to decreasing snow and rain. Yet Colorado continues to expedite the extraction of fossil fuels, which when burned worsen global warming, as the state clings to the economic benefits of jobs and tax revenue from the politically powerful oil and gas industry. The 300 scientists who produced the National Climate Assessment, including several based along Colorado’s Front Range, point to recent ruinous climate events as evidence that global warming is affecting the United States as never before and threatening to disrupt lives coast to coast. Those impacts are pretty much locked in until 2050 due to past emissions that raised atmospheric carbon dioxide levels to 410 parts per million. What happens after 2050 depends on how fast humans reduce air pollution from burning fossil fuels, clearing forests and other human activities that further load the atmosphere with heat-trapping greenhouse gases. “The message just gets louder and clearer as the years go by. We have got to deal with this problem,” said Colorado State University climate scientist Brad Udall, who co-authored portions of the climate assessment, which is produced every four years as mandated by Congress. Colorado Gov.-elect Jared Polis on Thursday weighed in on the climate assessment, vowing aggressive state-level action to deal with global warming impacts and also to tackle causes. “States must lead the way, because the federal government has dropped the ball,” Polis wrote in an emailed response to questions from The Denver Post. “My administration will be looking carefully at various options to not only deal with the potential short- and long-term impacts from climate change, but how to do our part to combat the root causes of global climate change through bold, proactive policies to transition to renewable energy. A five-term congressman, Polis last week was clearing out his office in Washington, D.C., and mulling possibilities for a state leadership team adept at cross-departmental dialogue in dealing with rising temperatures. “Climate change can touch every facet of people’s lives, and so there really isn’t a part of government that isn’t affected,” he said. “It’s preparing for floods and fires, but it’s also looking at how climate is affecting people’s health, how it’s affecting our economy now and is likely to affect it in the future. We will certainly be looking at how best to make sure we are taking a comprehensive approach to the issue and how our agencies can work together. The red needles on the pine trees are dead lodgepole pines that have been killed by the pine beetle infestation. These trees were found near Rollinsville near the Peak to Peak highway. For the West, bigger wildfires and a lengthening “fire season” have combined with population growth and building in burn zones to destroy more people and property, as seen in California’s recent devastating wildfires and fierce burns in Colorado this summer. The record-low mountain snow in southern Colorado and higher temperatures accelerated a climate shift toward aridity that favors frequent ignition. The cumulative forest area burned is increasing rapidly. 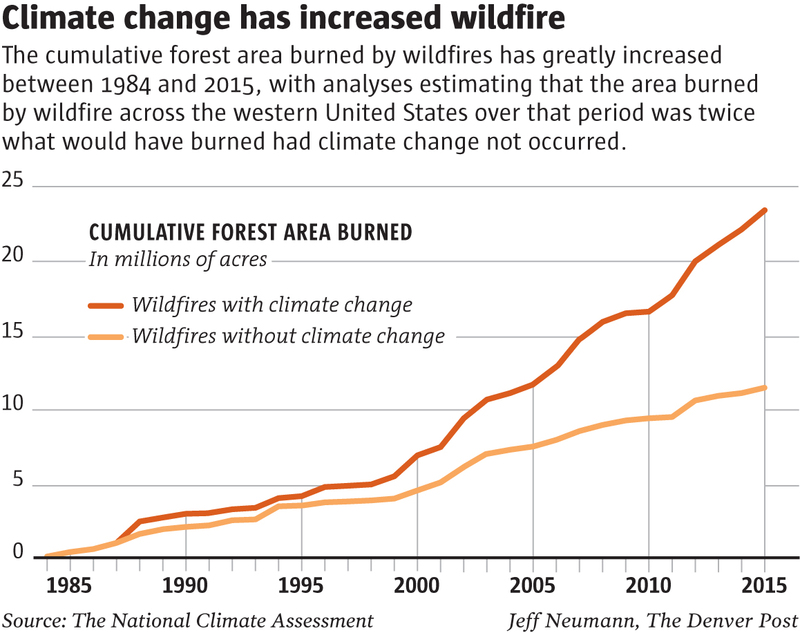 And federal wildfire analysts calculated that the 24 million acres burned across the West between 1984 and 2015 was twice what would have burned had global warming caused by humans not happened. Fires favored by climate change worsen the problem of more people building homes in forests and flammable former agricultural fields. Colorado state forester Mike Lester said in an interview that house-building and other urbanization in burn zones has left more than half of Colorado’s population — 2.9 million people — threatened by wildfire. That’s up nearly 50 percent from 2 million in 2012. State task force recommendations to limit construction in what insurers designate as the “wildland urban interface” mostly have been ignored by state lawmakers and property developers. The more people move into burn zones, the harder it becomes to restore forest health because safety pressures to suppress fire set up bigger fires in the future. Forests need fires to regenerate. Meanwhile, recent surveys show spruce beetles infested another 202,000 acres of Colorado forest, pushing their total damage above 1.7 million acres. This follows the ravaging of 3.7 million acres of forest by mountain pine beetles. Rising temperatures help inspects proliferate in out-of-balance forests, especially as winters pass without extended sub-zero temperatures, Lester said. Global warming is disrupting water flows, too, complicating the water supply necessary to allow more population growth in Colorado and other parts of the arid West. Rocky Mountain snowpack dipped to record low levels this year. Climate scientists have documented lower flows in rivers, including the Colorado River that farmers and urban developers tap as the main source serving 40 million people across seven states. Looming shortages compelled state officials to prepare emergency plans for curbing use of water from the government-built reservoirs and irrigation systems that enabled settlement of the West. Beyond water conservation, some cities are pushing for construction of new and expanded reservoirs to try to store more water when rain falls. The heat waves, with more days above 90 degrees throughout Colorado and the West — Denver alone now sees 50 to 70 days a year with 90-plus temperatures — drive more people to emergency rooms. Higher temperatures force lifestyle changes, keeping people and pet animals indoors. Climate scientists say the rising heat hits the elderly hardest, along with children and low-income people who cannot afford to run air-conditioning systems. Low-wage workers, including some on construction and public works crews, often are given no choice but to toil outside when temperatures top 100 degrees. Demand for artificially cooled air increasingly strains electricity grids, leading to power outages. And climate scientists say the conditions favorable for mosquitoes and ticks are spreading more sickness, including the Lyme disease that wreaks havoc on immune systems. The Zika virus is spreading northward. A light dusting of snow sits atop the mountains behind a red barn along Highway 285 south of Jefferson on Thursday, January 4, 2018. Colorado is experiencing a record low snowfall during the 2017-18 winter season. Dealing with impacts falls mostly — and unavoidably — to local governments. Some cities, including Denver, Fort Collins and mountain resorts, are joining together to lobby for help in adaptation and coordinated international climate action to reduce emissions. 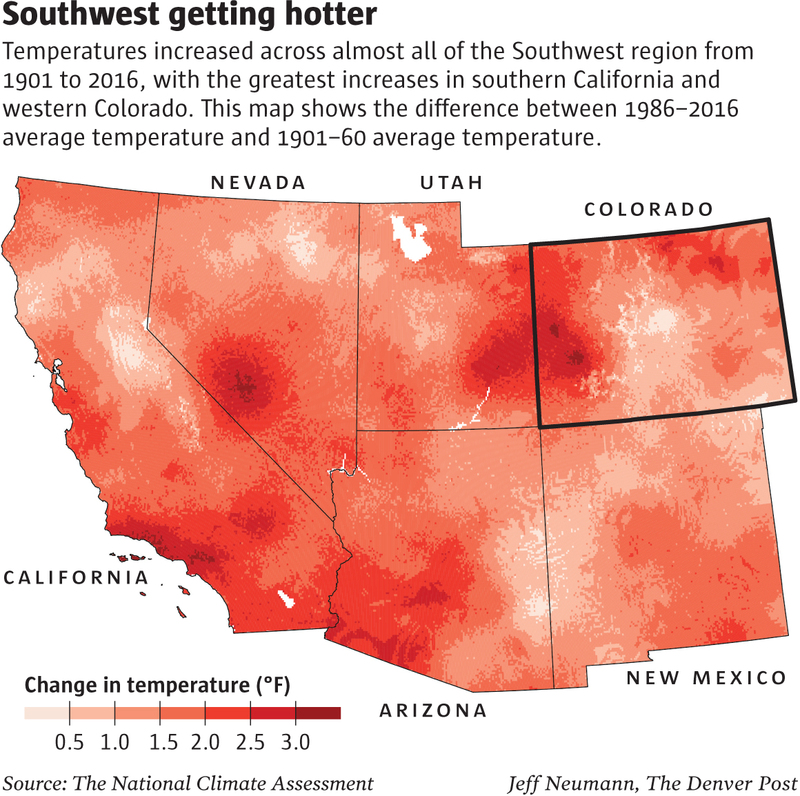 “The droughts, fires, threats to water supplies and heat waves — those things are all amplified and exacerbated by these increases in temperature,” said Gregg Garfin, a University of Arizona climatologist who co-authored parts of the national assessment focused on Colorado and southwestern states. Native Americans around the West are leading efforts to adapt, managing forests to increase resilience and restoring water flows where possible, said CSU climate researcher Shannon McNeeley, a national assessment co-author who has worked with tribes. Natives cultures grasped how the natural environment, beyond economic potential, enabled survival of life in the West, McNeeley said.